The county of Hants was established June 17, 1781, on territory taken from Kings County and consisted of the townships of Windsor, Falmouth and Newport. The name Hants is an old abbreviation for the English county of Hampshire, from the Old English name Hantescire. The Mi’kmaq were the first people of Hants County, having arrived several thousand years ago. They were semi-nomadic and hunted, fished and gathered to make their living. They made their encampments along the rivers at the “head of the tide” where the fishing was easy. Our summer student, Fadila Chater, has been tasked with a project that will creatively incorporate the diverse cultural history of Hants County. She is looking for people to interview in a short documentary film. She is looking for individuals from different cultural or ethnic backgrounds to share their personal stories or ancestral stories from either the Mi’kmaq, Acadian, African Nova Soctian, or new immigrant communities from the Hants County area. Does your family have a story? 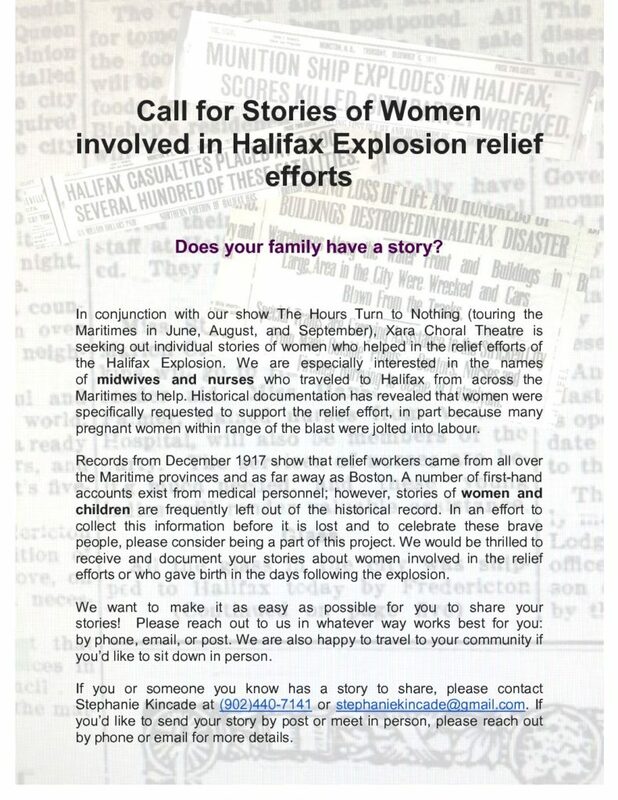 A Nova Scotian performance ensemble is seeking out information about of local women who helped in the relief efforts of the Halifax Explosion. Xara Choral Theatre Ensemble will be touring a show called The Hours Turn to Nothing to Annapolis Royal at Kings Theatre on June 10, which tells the story of nurses and midwives who came to the aid of pregnant women and many others who were hurt in the 1917 disaster. Historical documentation has revealed that women were specifically requested to support the relief effort, in part because many pregnant women within range of the blast were jolted into labour. The West Hants Historical Society is trying to compile a list of all the men and women from Hants County who served in World War 1 and 2. We plan to publish a book with all these names and we don’t want to leave anyone out; if your relatives or friends served in the military, please send us their details as described here. With Remembrance Day occurring this month, we have a special video from Tim Reed to honour the 112th Regiment who were based in Windsor and spent many months training at Fort Edward before going overseas. The Flags of the 112th still hang in Christ Church in Windsor. They were honored at a special service in June 2016. Please enjoy watching this video and remember the men of our 112th Regiment. One hundred years ago, on October 11, 1916, the Nova Scotia Highland Brigade left Camp Aldershot and boarded the troop ship “Olympic” in Halifax Harbour. They arrived in Liverpool, England on October 19, 1916 and continued their intensive training at Witley Camp in Surrey. There were 4 Battalions in the Nova Scotia Highland Brigade – the 85 th , the 185 th , the 193 rd , and the 219 th Battalions. That was over 4000 men, – all volunteers from Nova Scotia. Hants County Soldiers – Where Were They From? The Soldiers were farmers, clerks, labourers, teachers, lumbermen, and ship builders. They came from many places in Hants County – from Hantsport to Shubenacadie and Vaughan to Noel – and every village and town in between. Many never returned. Towards the end of July 1916, our 112th Battalion from Windsor set sail on the RMS Olympic from Halifax to Liverpool. It is interesting to learn that the Olympic was the first of 3 sister ships – the others were the more famous Titanic and the Britannic. All three ships were the same design, built in Belfast, and owned by the White Star Line. The Olympic started service in 1911, the Titanic in 1912, and the Britannic in 1914. We all know what happened to the Titanic on April 15, 1912. (The above photo was taken the month before in Belfast on March 6, 1912 – Olympic is on the left and Titanic on the right being outfitted for her maiden voyage). After the disaster, 24 lifeboats were added to the Olympic and the water tight bulkheads were improved. In Europe, the War continued with no victories after two years of heavy fighting. The Battle of the Somme was taking hundreds of thousands of casualties. In Windsor, our men in the 112 th Battalion were preparing to join the battle. The 112 th Battalion was formed in November 1915 with headquarters in Windsor, Nova Scotia. Men were recruited from all over Hants County, from the Annapolis Valley, and from the South Shore. Over 1500 men volunteered for service but only 1200 were accepted. The commanding officer was Lt Col. Hedley Tremaine of Windsor. Because the surname “Hebert” looks so much like “Herbert”, it is frequently misspelled, and when I first saw reference to the Herbert River in Hants County, Nova Scotia, what came to mind was the Bear River at Digby, Nova Scotia. It appears as “Hebert R” (probably for early explorer Louis Hebert) on Lescarbot’s 1609 map. By 1720, “Hebert R” had become “Beare R”. The West Hants Historical Society salutes our soldiers from Hants County that died in June 1916. June 1916 – Battle of Mount Sorrel : Canadian soldiers were defending Mount Sorrel, a 30-metre hill with a commanding position overlooking the city of Ypres in Belgium. On June 2 nd 1916, German troops attacked and overwhelmed the Canadians. They captured Mount Sorrel along with nearby peaks Hill 61 and Hill 62. The Canadians tried to retake the Hills on June 3 rd but the Germans repelled the attack. The West Hants Historical Society is saluting our local soldiers who died in World War 1. One hundred years ago this month, the following men were killed in action.